A delightful set of dolls to celebrate the birth of a new baby. Hand knitted in the finest lambswool, the family can be dressed to look like the real Mother, Father and new baby. Skin colour, hair colour and clothes can be made to match, while the baby comes dressed in a tiny nappy. When ordering your dolls, the more details you send Laura, the better. If you have a picture of the family, you can attach it here below or send one along later. She will use it to match the dolls to their real-life counterparts as accurately as possible, making this a truly special memento to treasure forever. 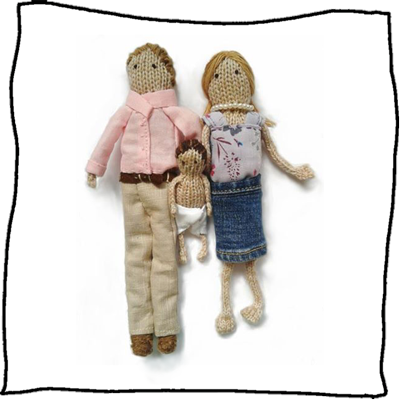 The My Little Family dolls are beautifully presented in a gift box. Dimensions: Adult dolls are approx. 18cms tall, baby is approx. 9cm tall. Select a single quantity in the box below for this family of three dolls.